The Musée de l'Armée, the Museum of the Army, is located in the Hôtel Les Invalides. It includes the Museum of the Liberation Order, le Musée de l'Ordre de la Libération, and the Museum of Relief Maps, le Musée des Plans-Relief. The Museum was created in 1905 by uniting the Artillery Museum with the Museum of the Historic Army. The Artillery Museum was created following the Revolution. The collection moved to Les Invalides in 1852 and was augmented by collections from the National Library, the Louvre, the Artillery of Vincennes, the Hôtle des Monnaies and many private collections. The Artillery Museum was officially installed at Les Invalides by 1871. The Museum of the Historic Army was established in 1896 by the Sabretache Society. Its collection of ancient arms and armor was considered the third most important in the world at the time. It also had the only collection of small artillery models in the world, plus an exceptional collection of pieces from Napoleon's army. The present-day Museum of the Army is one of the grand museums of its kind in the world. The Museum of the Army displays collections of ancient arms and armor, a classic collection of arms from the reign of Louis XIV, a department of 19th century weapons, an artillery department as well as emblems and flags, historical figurines, paintings, sculptures, stamps, sketches and photographs. The Museum of the Army traces the military history of France from Louis XIV to Napoleon III, from 1650-1851. It gives an overview of the French mounted troops from 1803-1939 and a look at the knives and firearms used by the French army from 1680 to the present day. The museum examines how the military changed between the Thirty Years War and the time of Louis XVI. It displays the weapons and equipment used by the armies and specifically those used by the guards of the royalty. The progression of the standardization of uniforms from the 17th century is also exhibited. Twenty rooms are devoted to the the period between 1789-1815, the years of the First Empire. Highlighted are the campaigns in Egypt and Italy which were pivotal in shaping Napoleon's future. Personal affects of Napoleon's are exhibited, such as his hat and coat. There is also a reconstruction of one of his campaign tents. The history of the metropolitan and the African Army under the July Monarchy is recounted. Also explored are the years of the Second Empire, the Crimean War, the Italian campaign, expeditions to China and Mexico and the Franco-Prussian War between 1870-1871. In June, 2000, rooms devoted to World War II were opened. These rooms occupy 2,000 square meters and are filled with exhibits describing the events that took place in France between 1940-1944. The Vichy government is looked at, as is the Resistance and the revival of the French army during the Italian campaigns and the landings in Normandy and Provence. General de Gaulle is spotlighted. The War in Russia, Africa and Asia are examined. The fall of Germany and the surrender of Japan and the horror of the concentration camps are also presented. The Museum of the Liberation Order, le Musée de l'Ordre de la Libération, was instituted by General Charles de Gaulle with an edict he signed on November 16, 1940. It was created to distinguish the combatants who fought in an exceptional manner for the liberation of France. It is also a memorial to the Companions of the Liberation, to the Resistance and to the Deportation. The Order of the Liberation is the second national Order in France, the first being the Legion of Honor. The museum encompasses over 1,000 square meters of three galleries, six halls, over 150 showcases and displaying 3,700 artifacts and documents. Exhibited items include personal souvenirs, pennants taken from the battlefields of Africa and Europe, various uniforms, drawings made by prisoners in the concentration camps, underground pamphlets, leaflets and newspapers. The museum has a Hall of Honor dedicated to General Charles de Gaulle. On display here are seventy-eight of his decorations, his last military uniform and the original text of his radio broadcast Appeal to the French People, given while in exile on June 18, 1940. The Museum of Relief Maps, le Musée des Plans-Reliefs, presents 28 examples of models of fortified cities created between 1668-1875. The entrance to these two museums is through the Museum of the Army. Also available at the Museum of the Army are a cafeteria, a library, a bookstore and a boutique. The Museum of the Army is open every day except Monday. It is also closed on January 1, May 1, November 1 and December 25. Its hours are from 10 a.m.-5 p.m. from October 1-March 31. Between April 1-September 30 it is open from 10 a.m.-6 p.m. Admission fees are 9 euros for adults, 7 euros on Tuesday after 5 p.m. There is no charge for persons under 18 years of age, or under 26 years old if EU citizen. One ticket allows access to the Museum of the Army, Napoleon's Tomb, temporary exhibits as well as to the Museum of the Relief Maps and the Museum of the Liberation Order. No tickets are sold 30 minutes before closing and free coat-check is provided. Many concerts are offered by the Museum of the Army, as well as receptions, galas and symposiums. There are four different venues for these occasions. There is the Grand Salon, which offers a beautiful view of Paris and the Esplanande des Invalides and the Alexandre III bridge. The Salons of Quesnoy is composed of three small salons that hold displays of arms and uniforms and equipment. The Auditorium, built in 1997, is located on the east wing of the museum. This room seats 150 people and is equipped for symposiums and seminars with film and video projectors. The Soldier's Church of the Church of St. Louis holds concerts several times a week and can welcome up to 550 people. The Discovery Tour: This tour offers an appreciation of the collection of the Museum of the Army, a brief history of the Hôtel des Invalides, a visit to the Ancient Arms and Armor collection, the Napoleon section and a visit to the Eglise du Dôme and Napoleon's Tomb. The Secrets of Les Invalides Tour: This tour visits the promenade of the Hôtel des Invalides, the Eglise du Dôme and the Eglise des Soldats, the Soldier's Church, also known as the Church of St. Louis, focusing on the architecture and the lives of the 18th century boarders of the Hôtel. It visits places usually closed to the public: the Honor Room, the Rooms of Ornano, the Caves of the Governors and the Crypt Fieschi. The Vauban Tour: This tour is dedicated entirely to a visit to the Musée des Plans-Reliefs, the Museum of Scale Models. 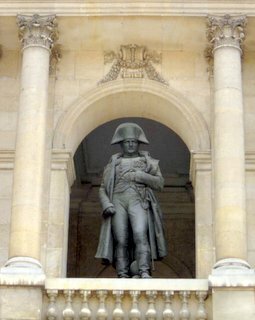 The Napoleon Bonaparte Tour: This tour concentrates on Napoleon I. It visits the Empire Rooms in the museum and the Eglise du Dôme. His personal souvenirs are viewed, his role as a man of war is examined as are his law and administrative works, plus a visit to his tomb. The Napoleon III Tour: This tour concentrates on the last days of Imperial glory. Visited are the Rooms of the Second Empire and the uniforms of the time, as well as the technical innovations that were to change warfare in the 20th century. The General de Gaulle and Second World War Tour: This tour visits the rooms regarding World War II. The Grand Battles of Napoleon I Tour: This tour focuses on Napoleon as the Man of War, emphasizing his strategies, his military campaigns, the Wars of the Republic, 1796, and Waterloo, 1815. It visits the collection of the First Empire and Napoleon's tomb. The France in Torment Tour: This tour chronicles the life of France from 1940-1945. It focuses in particular on the conflict, the divisions of the French and the Resistance. The Posters of World War II Tour: This tour discovers the posters, the notices, the texts and the leaflets in the lives of the civilians and military between 1939-1945, covering also the newspapers, journals and radio. The Mysteries and Legends of Les Invalides Tour: This tour delves into the mysteries and legends of Les Invalides such as the story of Napoleon's statue, the mysteries and construction of the Dome and the "Legend of the Invalid with a Wooden Head". The History Tour: This tour covers the history of France as seen from the stories that have developed at the Hôtel des Invalides; the daily life of the borders, the image of Napoleon I through the different regimes and stories of the Occupation and the Resistance. The Women of Les Invalides Tour: This tour discusses the influence of the women at the Hôtel such as the Grey Sisters, who were occupied with the borders of the 18th century and the women of the Resistance and the past queens and empresses. Les Invalides in Paintings Tour: This tour traces the military history of France through the paintings of the museum and those of the Eglise du Dôme. For further information, visit the Museum of the Army website.